One of the things that German composer Karlheinz Stockhausen (1928-2007) found so fascinating, so wonderful, in the Universal was its endless capacity for diversity. He composed it in his music, where he would bring a plethora of musical material together under a single, unifying, structural idea. He found it in the cosmos, in which he heard countless vibrations and saw limitless rotations and trajectories, all held together by the laws and music of physics. And he saw it in the many spiritual and religious practices of the world's cultures, which to him were all expressions and adorations of the single, all-embracing power of the Divine. He sought to compose this into his music too and, as he travelled the world and learned more about the different ways in which its peoples believed and worshipped, not only did his own sense of what adoration of the Divine can mean broaden but so, too, did the ways in which he incorporated this into his music. One of the most beautiful and original manifestations of this, his constant quest to adore God through music, was composed in 1973-1974: INORI, for orchestra and one or more soloists. 'Inori' is the Japanese word for 'prayer' or 'adoration', and it is through the soloists (there are usually two of them, but it has been performed with only one and, recently, with six) that the world's many different approaches to prayer and adoration are captured. 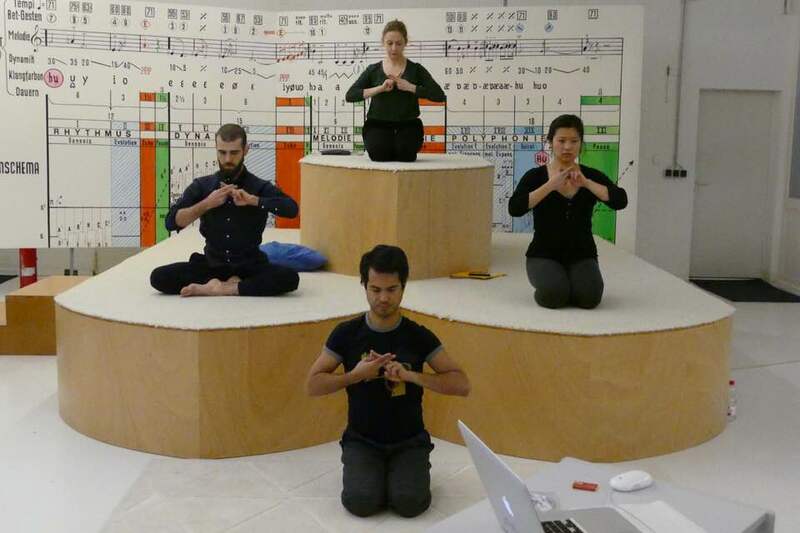 The soloists of INORI are dancers or mimes, but their part is notated musically, with numbers written above the notes, each number indicating one of 13 different 'prayer' gestures that Stockhausen had observed from different world cultures. 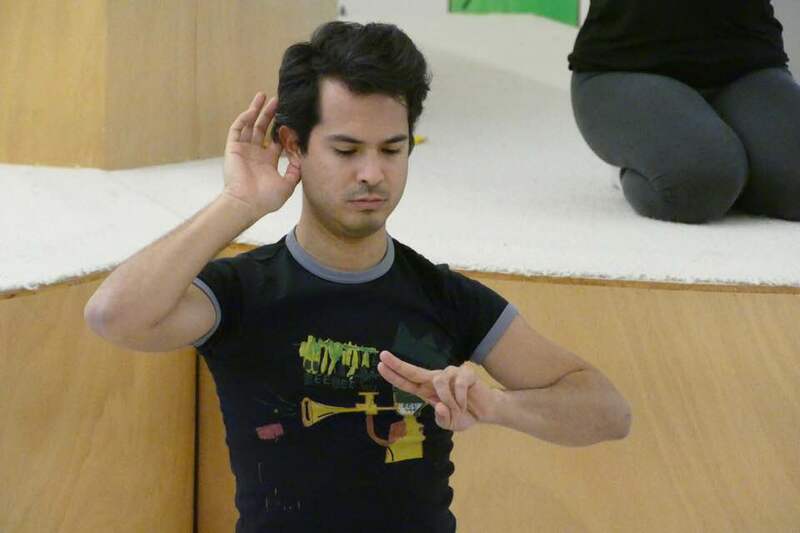 The pitches, dynamics, and durations of the notes determine how the gesture is expressed – how high or low the hands are placed, how near to or far from the body, and how closed or open the hands are. In some of INORI's more complex moments the left hand, right hand, and head are all notated separately. At over 70 minutes duration, it is a huge and demanding work for the soloists, who must perform it from memory, kneeling or standing as the score requires, with all the precision and subtlety that would be required of any musician performing a piece of complex modern classical music. The work is Stockhausen's most original integration of liturgy and music, where the music becomes a vehicle not for carrying the words, but rather the physical expression, of divine adoration. 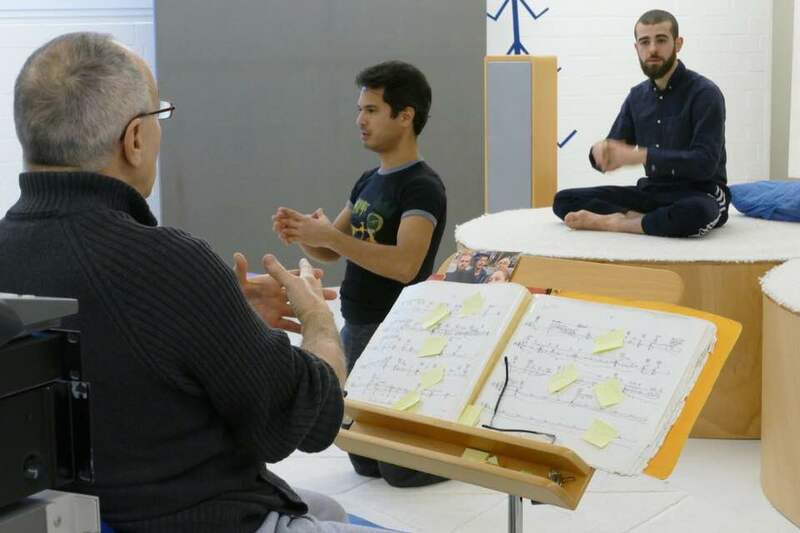 Through drawing on prayer gestures from world cultures, and unifying them through a complex and highly structured system of musical notation, the ultimate result is an extraordinary celebration of both the universality and diversity of prayer. The music itself reinforces this, structured by Stockhausen's signature systems of patterns and formulas, which for him would bring together both the mathematics and the magic of musical form. INORI is not performed often and only a small handful of people know how to do it at all. But this year, the Lucerne Festival put out public calls for people to audition to learn the part for the 2018 Festival. Four people would be chosen who would then work, in Kürten, Germany, with the two artists who have performed it most often – Kathinka Pasveer, who lived and worked with Stockhausen since 1982 and has performed INORI since 1989, and Alain Louafi who has performed it since its premiere in 1974. The Stockhausen Foundation, itself located in Stockhausen's home town of Kürten, support the project. 32 people submitted video auditions and, of these, 13 were brought, from around the world, to Kürten for live auditions and the final four were chosen: Emmanuelle Grach and Jamil Attar, both dancers from France; Diego Vásquez, a clarinettist from the USA; and Winnie Huang, a violinist from Australia. All four are young people who bring to INORI different cultural, life, and artistic backgrounds. They will now come to Kürten for two days every month to work with Kathinka and Alain on the piece and, while I was visiting Kürten in November and December this year as part of my own study of Stockhausen's music, I had the huge privilege of being able to watch their work. 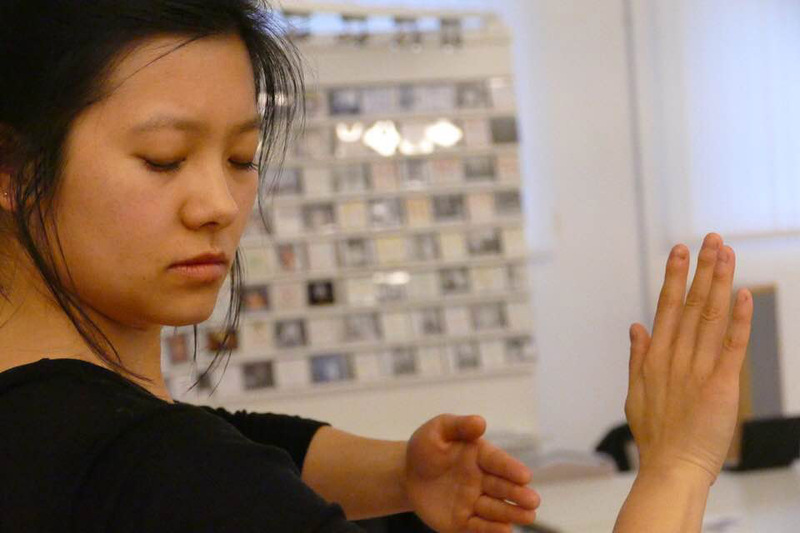 The process of witnessing these rehearsals itself captures much of what INORI is all about – seeing the bringing together, the unifying, of difference through the work's transformative embrace of spiritual diversity. These young people, who bubble with life and energy, who have become my friends and who share with me laughs and meals and drinks and silliness, make their way, from their different directions, their different worlds, onto the huge podium that is placed in the Kürten rehearsal studio – a stunningly beautiful building known as 'the White House' – and, the moment the first notes of the piece ring out through the huge sound system there, they are changed. They become statuesque, majestic, intense. Humility and dignity shape them. And a different sort of life seems to take hold of them: an inner life that connects them, invisibly but unbreakably, to the music, to the spirituality it expresses, to the cosmos that its composer believed breathed and vibrated with that spirituality, and to one another. It is amazing, goosebump-inducing, to watch. Quietly, but with the gentle authority that comes from knowing a piece such as this so intimately and for so long, Kathinka and Alain make their corrections and comments. This hand is a little too high here, here the eyes should be closed, here the head turned and held for a few seconds longer. Perhaps it would be more beautiful if you held your fingers this way rather than that. And slowly the piece forms into the work of incredible precision and poetry that it is. The music of INORI is grand and intense. It builds its elements slowly, as first its rhythm emerges, then its dynamics, then its melody, its harmony, its polyphony. It tells of the emergence of spirit through the genesis of music – of spirit universal, human, divine, cosmic, eternal. Music becomes the metaphor for the spirit. Even though these four incredible young artists have become good friends of mine, I have never asked any of them about their own spiritual beliefs. In some ways, to do so, would be to destroy the magic of INORI – its power to unite what is different and to transform it into a boundless unity of adoration, where there are no longer boundaries or dogmas or definitions of how the Divine should be understood or adored. Stockhausen's spirituality, like his music and his cosmology, was big and adventurous. It always sought to find new ways to realise the task that he felt had been put upon him from beyond – to be a means by which the realms of humanity and divinity could understand one another. Nowhere is this done more boldly or more beautifully than in INORI. To see this marvellous work begin its first steps of being passed on from its original custodians – Kathinka and Alain – to those of its future, has been a magical, wonderful, experience.